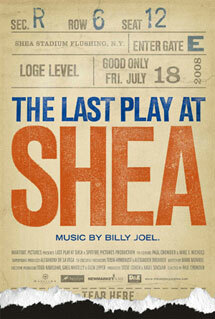 The Last Play at Shea: ONE NIGHT ONLY! I just found out that THE LAST PLAY AT SHEA is having a limited theatrical release for one night only this Thursday, October 21st. I have a shoot that day and hope to make it. I bought tickets for it just now and the theater was virtually sold out—albeit, it looks like the smallest theater in the house at the Arclight Hollywood. Unfortunate. Maybe they’ll extend it a day. Go see it if you can! Click here for a list of theaters by city. The official trailer is above.